Touted as one of the most unforgettable road trip adventure in all of Latin America, the La Paz to San Pedro de Atacama route crosses what is inarguably one of the most stunning plateaus on the planet. The Bolivian Altiplano is an ethereal world of colours and contours, of dramatic scenery and rugged horizons, of hardy wildlife and out of this world sunsets. This is the Bolivian Outback: that remote corner of the country that’s difficult to reach but totally impossible to forget. The natural wonders, out here, are simply breathtaking. A high altitude plateau that covers the divide between the eastern and western Andes Mountain, the Altiplano sits at an eye-watering elevation of over 3700m and stretches for over 800km, encompassing treasures such as the Salar Uyuni – the largest salt flats in the world –the flamingo-filled Laguna Colorada and a flurry of colonial-era mining towns (like Potosi and Uyuni) that seem to be stuck in some kind of time-warp. The visual feasts are noteworthy, with the seemingly endless undulating and multi-coloured horizons framed by vertiginous snow-capped peaks. A land of volcanoes and sulphur lakes, of iridescent-coloured lagoons, steamy geysers, multihued deserts and surreal thermal hot springs. All right there. In the middle of nowhere. A tough and arduous journey, in many ways, a crossing of the Bolivian Altiplano will see you contend with extreme wind and cold. Such is life on this high-altitude, barren yet mesmerizing world. A photographer’s ultimate paradise, the Altiplano is one postcard-perfect frame after another and although the singular highlights are astonishing, the entire experience of living it and seeing it is magnificent beyond words. 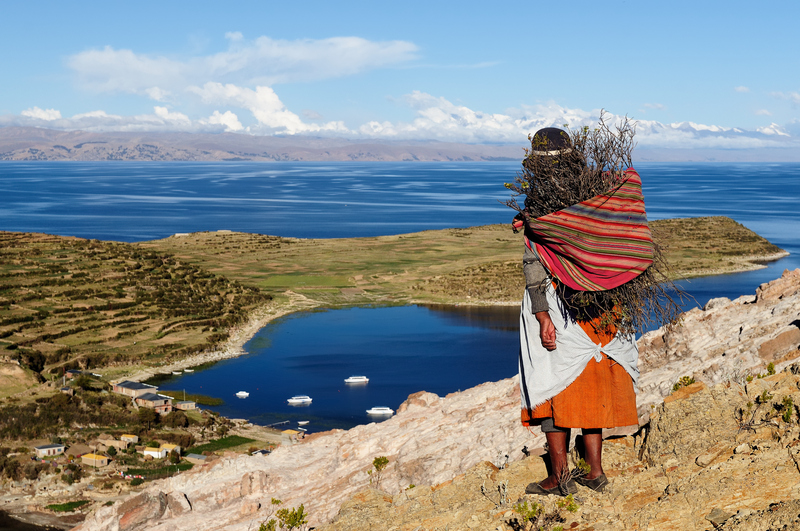 Lake Titicaca – The world’s highest navigable lake (3800m) and South America’s largest, sits on the northern end of the Altiplano, right on the border with Peru. On a crystal-clear day, the lake is utterly resplendent and you’ll want to take a couple of days here to soak up the sights and the sites. Visit the floating Uros Islands, take a walk on picturesque Taquille, enjoy an overnight homestay with a local family and, if you’re game, shed the layers and swan dive into the rather chilly waters. The best base town to visit Lake Titicaca is on the Peruvian side is Puno. 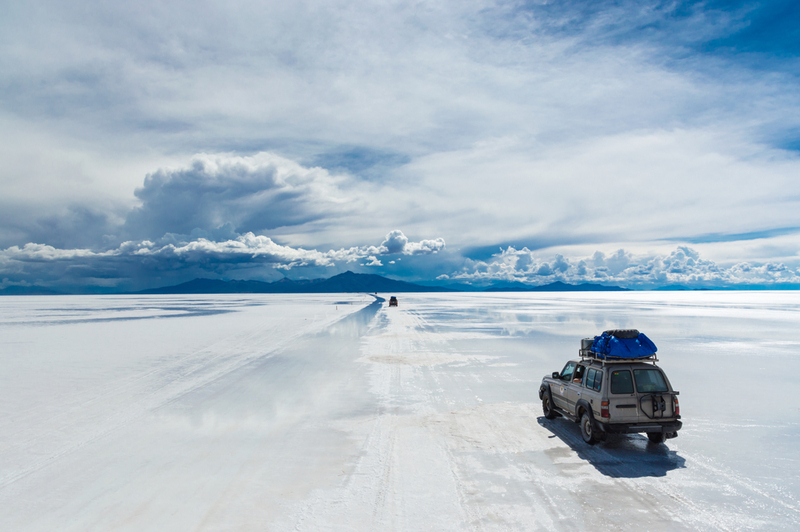 Salt Flats of Uyuni – The crown jewel of the Altiplano, the Uyuni Salt Flats are the favoured playground for all who venture this far. The endless horizons of blinding white salt are ethereal and make for fantastic photographic plays. Whether you visit at dry season when the crumbling ground cracks under your feet, or during the wet season, when the plains serve up a mesmerizing mirror-like effect, the visual spectacle is unrivalled. Driving on the Salt Flats is great fun and aside from the entertaining modelling shoots, you can visit the entrancing Salt Hotel – made entirely of salt bricks – or the many cactus-topped islets propped up in the most unlikely of places. You can spend hours, or make that days, just exploring the furthest reaches of this gargantuan salty plains. Reserva de Fauna Andina Eduardo Avaroa – Established in 1973 and covering an area of more than 7000 square km, the Avaroa reserve is the most famous and visited protected reserve in Bolivia and the area you’ll spend of your time travelling through as you cross the Altiplano. It is located south of the Uyuni Salt Flats. 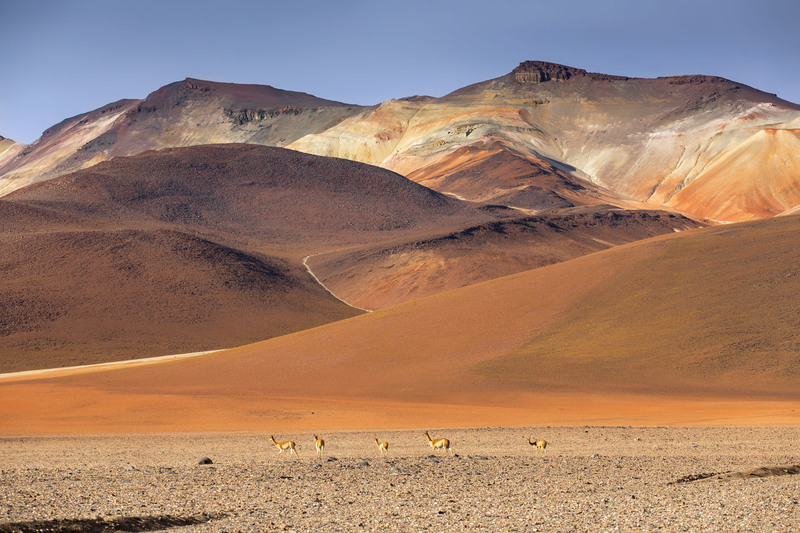 With its stark, otherworldly beauty and mineral-rich landscapes, this section of the Altiplano throws up a mind-boggling array of colours, with ancient salt lakes tinged in various shades of iridescent red and green. Snow-capped peaks will frame the way through the high-altitude deserts that have inspired artists since time immemorial and wind eroded rock-formations, shaped to resemble animals and objects, will be some of the most photogenic subjects you’ll come across. On a crystal clear day, with a backdrop of sapphire skies, this section of the Bolivian Altiplano may well seem the most picturesque place you have ever seen. And we bet our bottom dollar it actually is. 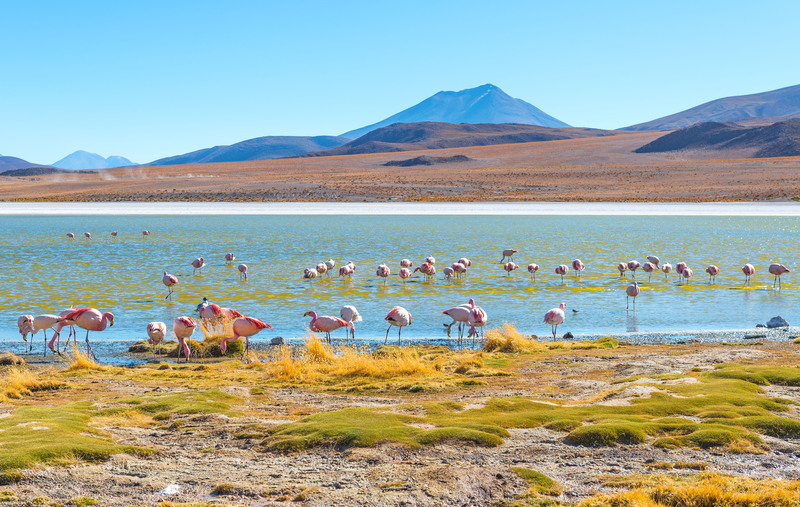 Some of the endemic creatures in the region include Andean condors, vicunas, viscachas (furry little fat marmot-like rodent) and Andean foxes, yet the wildlife highlight of the Altiplano would have to be the flamingo. All three flamingo species that live in South America are seen right here, including the rare James flamingo. Laguna Colorada, Laguna Verde & Laguna Blanca – Just north of the border with Chile is where you’ll drive past the most famous coloured lagoons on the Altiplano. Framed by ancient volcanoes and displaying colours and wildlife galore (this is where you’ll probably see the most flamingos), the lagoons and surrounding geysers and thermal pools (the Termas de Polques and its delightful 30 degree C waters are divine to soak in on a hard day’s drive!) are the most vibrantly coloured highlights of the Avaroa Reserve. Sol the Manana – The Morning Sun, as the name translated from the Spanish, is a glorious volcanic field on the north-western border of the Avaroa Reserve, where you’ll see, close up, steaming pools and lakes of geothermally heated mud. The most forceful steam holes are best seen at sunrise, although considering Sol de Manana sits at a breath-catching elevation of just over 4800m, you will want to don several layers if visiting at first light. The sights and smells of this field are simply extraordinary and it’s certainly worth braving the early morning freezing temps to see it at its best. 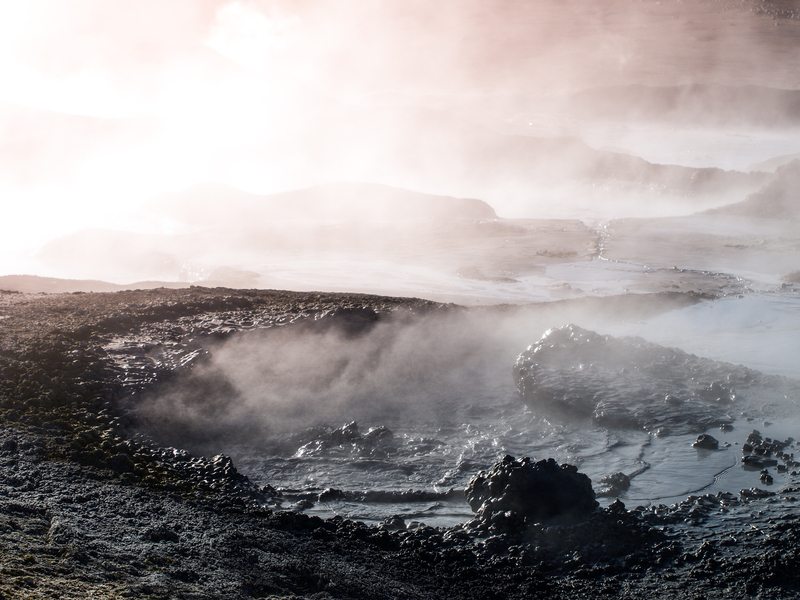 The most unique aspect of these thermal mud pools is that you’re able to walk right among them, closer than you ever could if they were anywhere else. So take care…and be amazed! Cities & towns of the Altiplano – The natural beauty of the Altiplano far outweighs any human-made enticement up here, yet considering the fact you will have to drive past some historic towns (to stock up on supplies at the very least) it is worth stopping for an afternoon to take in the sights. La Paz, the enthralling Bolivian capital, is the largest city on the Altiplano and the one most deserving of your time. Enticing open-air markets, souvenir shopping, excellent food and a few great museums will entice you to stay at least 2 nights. Further south, you can take a mine tour in Potosi, once one of the richest cities in the New World, and don’t forget to catch the sunset at the surprisingly interesting train cemetery in Uyuni, where rusted old locomotives and carriages make for some amazing photography. The Altiplano inhabitants – As hard to believe as it may be, the whole Altiplano was inhabited for centuries before the Spaniards arrived in the 1500s. Pre-Columbian cultures include the Tiwanaku, Chiripa and, of course, the mighty Incas. Descendants still live as they always have on this arid and harsh plateau and many are still involved in mining as well as herding of native animals whose prized wool is internationally revered. San Pedro de Atacama – The last highlight (or the first, depending on where you start) of a Bolivian Altiplano crossing is San Pedro de Atacama, one of the most charming desert towns in the world. The lunar-like landscapes of its nearby (and aptly-named) Moon Valley are perhaps the only natural features that can rival those of the Altiplano itself. 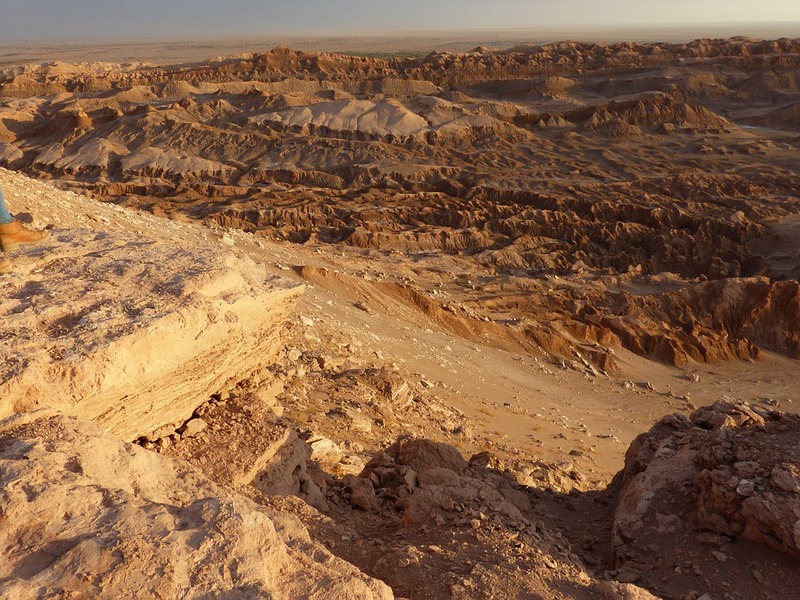 The Atacama Desert is northern Chile’s premier highlight and including a few days in San Pedro, in order to soak up the sights and tackle a few excursions (which you can do by car, horse or mountain bike) is well worth your time. Hot-air balloon rides and stargazing, in this pristine, light-pollution free environment, are unforgettable treats you ought not to miss. Given the high altitude of the Altiplano, you can expect very cold temperatures all year long and you’ll have to pack and prepare accordingly. It may be counterintuitive to suggest you travel here in the winter months – between May and October – yet considering the temps will always be cold, the winter is the only real guarantee that your road travel won’t be disrupted by heavy rains and flash flooding. Not so much on the Altiplano, mind you, but certainly in all surrounding areas and roads that lead to it. Crystal clear winter skies make for fantastic days of explorations and even better photography, so if you can choose, plan to take your road trip during the cold but dry months. 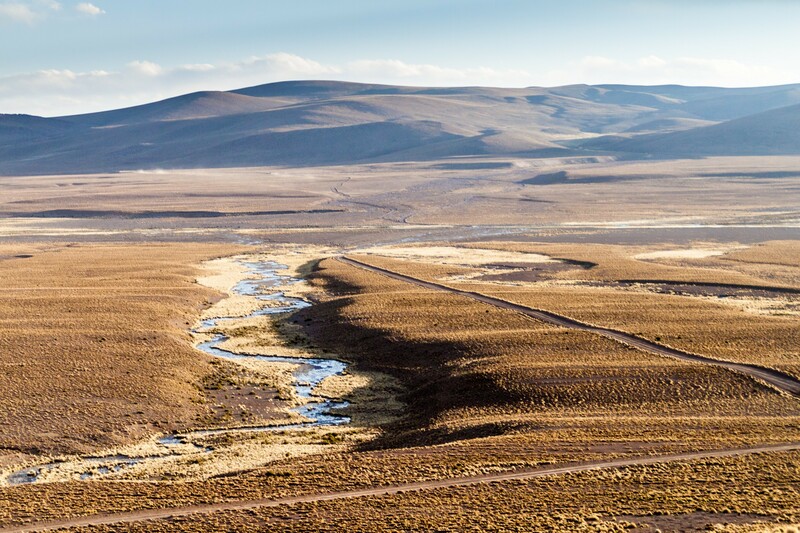 The Altiplano itself technically starts just over 200km south of La Paz, in a town called Oruro, and ends as it meets the spectacular Atacama Desert, just across the border in Chile. It also borders Peru and Argentina, yet the main access points are from the Bolivian and Chilean sides. For travel purposes, a tour crossing the plateau is taken from the Bolivian capital, La Paz, to the charming desert Chilean town of San Pedro de Atacama. You can choose to do only some sections of the Altiplano if time is of the essence (like our 5-day Uyuni, Potosi and Sucre tour) or take a few extra days to experience the best of the region (as in our 10-day Atacama to Uyuni Travesia). Given the actual ease of transport to and from both sides (several regional airports allow for fast transfers) your options are numerous. Start your road trip in one country and finish in another or you do return loop trips from either the Bolivian or Chilean side. Whatever suits best your continuing travels. If you’re not sure how to fit a visit to the Bolivian Altiplano on your next visit to Latin America, check out our Bolivia tour itineraries and contact us. We’ll help you plan a time-savvy and cost-effective itinerary with guide, private vehicle and everything you’ll need for your crossing. Bolivia hosts some of South America’s most striking vistas, from the soaring peaks of the Cordillera Real to the vast white expanses of the Uyuni Salt Flats and the remote Altiplano with its coloured lagoons and conical snow-capped volcanoes.